The New Macross Is Filled with Transforming Fighter Planes and... Magical Girls!? On New Years’ Eve here in Japan, we got to see a special preview cut of the first episode of upcoming anime Macross Delta. It has things we’ve come to expect—like transforming fighter planes—and things we haven’t—namely magical girls. 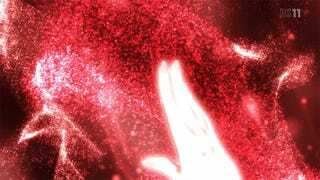 Taking place eight years after Macross Frontier, the previous Macross anime, Delta follows the humans (and Zentradi) who have settled on a cluster of worlds near the galactic rim. But while they are far from the threats that have plagued past Macross heroes, they are faced with a new danger: Var Syndrome, a disease that causes people to suddenly turn murderously violent. Luckily, a treatment for the disease has been found in the form of the voices of the four-girl idol group Walkure. Aided by the Delta Squadron, these girls go to wherever Var Syndrome outbreaks occur and attempt to save the infected mid-rampage with the power of song. Our heroes for this outing are Freyja Wion, a runaway girl planning to audition to be a member of Walkure; Hayate Immelman, a talented but lazy load lifter mecha pilot; and Mirage Farina Jenius, Delta Squadron pilot and descendant of the original Macross’ ace pilots Max and Millia. The preview episode starts out well enough. It introduces the basic setting and shows the first meeting of Freyja, Hayate, and Mirage—along with some short character building scenes for each. Unfortunately, at about the halfway point of the episode, it becomes a total mess. With a Var Syndrome outbreak, we are suddenly thrown into a conflict between the infected and the four members of Walkure plus their corresponding pilot protectors. Yet, as that fight is winding down, five new pilots appear and begin attacking Delta Squadron, Walkure, and the city. This means that including Freyja and Hayate, we are now attempting to keep track of no less than 15 characters we have only just been introduced to. It is far too much too fast. We don’t know anything about the attackers’ motivation—and not much about Delta/Walkure’s other than the most superficial. Though the aerial dogfights look great, they have little impact overall without a personal connection. The conflict seems little more than a chaotic blitz of music and action as we have no emotional stakes and no one to root for in the battle—other than Mirage who does very little. Our other two heroes, Freyja and Hayate, do even less—watching the action unfold as simple spectators. On the music side, we hear three of Walkure’s songs. The first two are derivative idol j-pop and are largely forgettable. The third song, “Ikenai Borderline,” is great though—hence why it is used for the climax and credits. But now it’s time to address the elephant in the room: Walkure themselves. While using the power of song as a weapon is one of the staples of Macross, past singers have been exactly that: professional performers. They sing on a stage or from within a specially designed mecha. But in Macross Delta Walkure is composed of “magical girls” complete with transformation sequences. They can do everything from flying to controlling unbreakable barriers with a wave of their hands. While their “magic” is clearly technology-based, it is something so unexpected in a Macross anime, it’s likely to throw even longtime fans for a loop—I know it did me. That said, it is still very much a Macross anime. After all, it has the three necessary elements: transforming mecha, songs, and a love triangle. And while Macross Frontier was in many ways an homage to the original Macross, Macross Delta seems to fill the same roll with regard to Macross 7 (with its group of singers) and Macross Plus (with its transforming-plane on transforming-plane combat). In the end, this prototype episode of Macross Delta tries to do far too much in its 24-minute run time and suffers for it. While it looks great visually and I am genuinely interested in seeing more, the amount of new information and other curve balls thrown at the audience raises so many questions it’s overwhelming—as are the amount of characters to keep track of. Luckily, this is a prototype episode, so perhaps much of this will be sorted out by the time the series makes its true premiere this spring. But seriously, can someone tell me what the hell is up with the glowing heart and star-shaped hair antennas? 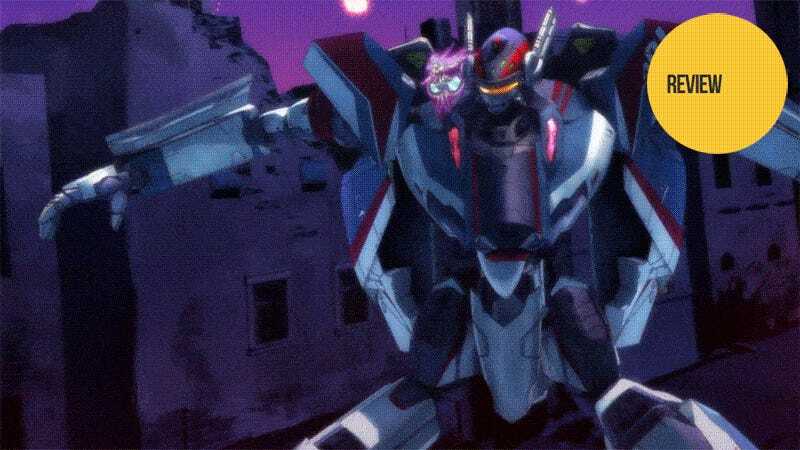 Macross Delta: Mission 0.89 aired on Tokyo MX in Japan. There will likely be no international release.